If you are still a beginner in playing an acoustic electric guitar, most likely you are looking for the basic features rather than looking for the advanced ones which may not yet complement your current skill level. One good option is getting for yourself an affordable, yet promising option on acoustic electric guitars. The good news is that there are a lot of options out there, and you can definitely find the best acoustic electric guitar under 300 dollars. With the availability of several options, however, making the best choice can be somewhat daunting. To help you in coming up with a well-informed decision, we have come up with the top 5 best options out there. Prepare to look into the features, advantages and disadvantages offered by these options. While others say that what you pay is what you get, in the guitar industry, there are a lot of manufacturers that offer high quality acoustic electric guitars at affordable prices, without sacrificing quality. Even the detail and construction of these guitars below $300 are still given attention by well-known manufacturers. This is the reason why the market is filled with several brand competitions. Make sure that you purchase your guitar from a respected and reliable brand. A guitar that is backed up by a manufacturer’s good reputation is also a guarantee in itself when it comes to quality. Aside from the brand, you also need to look into the kind of wood used in the construction of the guitar, the overall quality of sound, as well as the various features included in the guitar. It is also highly recommended to look into the action of the guitar. This is especially true if you are a beginner guitar player. Action refers to the distance between the frets and the strings. Guitars that are non-branded usually have bad action. Sacrificing action may leave you in pain after a couple of hours playing your guitar. Consider your purpose of use. Under the category of $300 guitars, there are ones that are heavy, while others are pretty much lightweight. Therefore, you need to determine whether you need a guitar that you can carry with you wherever or one in which you would not mind leaving at home where you can play it. Acoustic electric guitars also come in various sizes and shapes. The size determines the sound projection and tonal emphasis. For instance, a dreadnought body style features a driving sound which is loud and powerful enough to be heard even across a room distance. There is just something that is stylish and elegant with a classical guitar. Aside from their capability to achieve that perfect rhythm, they can also create intricate melodies. These are among the capabilities of the Washburn Classical Series C5CE Classical Acoustic Electric Guitar. Appearance wise, this guitar features a spruce top as well as catalpa back and sides. Its neck is also made out of mahogany, as well as a finger wood that is made out of rosewood. This model of guitar is often complimented because of its flat neck and low string action. Also, its cutaway design makes it possible to access the upper frets quite easily. It also has a natural finish, and a touch of an orange tint. This intricacy in design all over the sound hole provides this guitar that amazing classical guitar feel and look. This guitar is an amazing option, regardless of your current skill, as it comes with larger spacing for the strings, thus enabling for precise finger playing. It is a great choice for flamenco and classical players, as it features the use of nylon strings that create a full and smooth tone. By far, the most attractive feature of this guitar is its price. At a price below $300, you have a good guitar to start learning how to play with. Despite its price, the quality is never sacrificed. I believe that this acoustic-electric guitar is the idea for playing live because it is equipped with high-quality onboard EVT electronics that perfectly reproduces the tone of the guitar through a live sound system. On top of that, it even has its timer. Want more product from this brand, checkout at here: top 5 Washburn Guitar Review. The Yamaha JR2TB S 3/4 Scale Guitar is a compact sized acoustic guitar which is patterned after the well renowned Yamaha FG lineup. It is also engineered with a substantial taste. Therefore, comfort while using it is an assurance. It also features an authentic acoustic tone, making it a play anywhere, take along guitar. This guitar features a mahogany ultra-thin finish on the side and back, thus offering an elegant and attractive look. It even comes with a gig bag which protects the guitar as you carry it along with you anywhere. 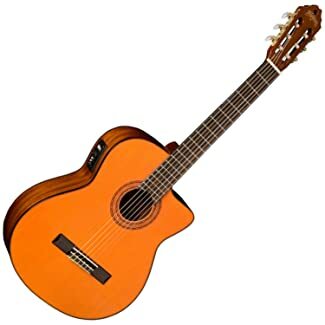 You will never go wrong with this model if you are searching for an affordable, nice ¾ scale acoustic guitar for beginners, such as children. Even for adults, this option is perfect as you can expect to enjoy hacking around some learned guitar playing techniques on it. It is also idea for those traveling musicians and songwriters who just wants to bring along a guitar whenever they go and play music anytime. What really stands out about this option is its size and portability. This guitar is also made amazingly, with the capability to hold perfectly the tune that it creates. It produces a warm, rich tone which is beyond what is usually expected from guitars its size. What I like about the Yamaha JR2TB S 3/4 Scale Guitar, aside from its tonality and sound, is its compact size. As such, it is a perfect option for campfire sing-alongs, as well as road trips. The Yamaha APXT2 3/4-Size Acoustic-Electric Guitar is a compact sized guitar which has been designed for those who travel frequently, as well as those who need a guitar for practice. It is also ideal for gigs, as well as beginner guitar for young players. With just a body depth measuring 65 to 75 millimeter, measuring 36.2”x16.5”x4.5”. It is relatively smaller compared other models in this category. However, its size does not affect its performance. The back and sides of this guitar are constructed out of meranti, and its bridge and neck built out of mahogany. Between the body and the headstock is a fingerboard made of rosewood above a dovetail joint. This guitar model also comes with a variety of color options, including dark red burst, old violin sunburst, natural, as well as black finish. Regarding onboard electronics, this model is equipped with a unique pickup system with ART (Acoustic Resonance Transducer). With this, you can plug this guitar into any amplifier or PA system to produce a full-bodied acoustic tone. Included is a well-padded gig back which makes this guitar easy to carry around. Unfortunately, however, this bag is the only accessory that is included in the package. This means that you may have to pay for other accessories if you need them. One thing I really like about this model, being under the Yamaha brand is that it is durable and resilient. It can serve, not just as a travel guitar, but also as a beginner guitar, even for children. As such, I consider it as an affordable option to other more expensive acoustic electric guitar models. The Ovation AB24-HB-KIT-1 guitar comes with all the essentials needed to produce style and sound quality. It produces a well-defined and loud voice, great overall value as well as smooth playability. As such, it is ideal for both beginners and intermediate players. Among its features include the sculpted center sound hole and Applause-style headstock well adorned with the standard chevron rosette pattern. Other premium features include a mid-depth round back Lyrachord body which ensures better projection and greater volume. It also offers a laminated spruce top which ensures articulate and clear tone, alongside supreme durability and excellent balance. This guitar also features comfortable, fast action, together with a very easy to play neck profile, as well as a preamp system that features a built-in tuner for amazing performance and superior amplified tone. The complete kit also includes other items including ChromaCast 80/20 med-light guitar strings, nylon guitar strap, 6-inch cable, 4 pick sampler, as well as online guitar lesson. These extra features make this model ideal for beginners. What I like about this guitar is its excellent quality even for the price. It is quieter than most models while presenting a smaller depth overall. It also features a good action minus any buzz. The Oscar Schmidt OD312CE 12-Strings Acoustic-Electric Guitar offers an amazing choice for its price. It highlights some interesting features, including a select spruce top, fingerboard made of rosewood, mahogany sides and back, adjustable truss rod and diecast tuners. This guitar also features a gorgeous and expensive looking marquetry rosette which adds further to the overall beauty of this guitar. It also comes with a 12-string dreadnought and a cutaway for easy access to the upper fret. The action of this guitar also makes it possible to play the 12 strings. At the same time, it is equipped with an MET-A07 tuner/preamp which introduces the full lush as well as chiming sound produced by all 12 strings through any amplifier or PA system. This acoustic-electric guitar is well balanced and nicely designed. It also feels really comfortable. The action is quite close, without no noticeable buzzing. With the provision of position markers, everything is visible while playing. Having your very own acoustic-electric guitar will provide you with the power to play with music, just the way you like it. 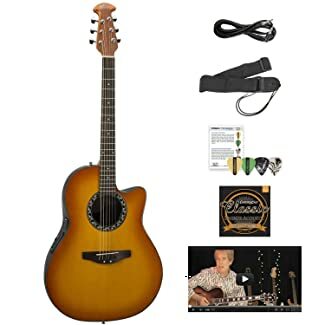 If you are a beginner in this field, having the best acoustic electric guitar under 300 dollars is a good place to start with. You may already have some knowledge on how to choose a good guitar or are completely clueless about the features that you need to look for. With the reviews provided above, you now have a glimpse of the capabilities, features and advantages that you can expect out of each model. In the end, it all boils down to your personal preference to select the best one that will fit your requirements and needs. Still, when it comes to a combination of features, quality and affordability, the Yamaha JR2TB S 3/4 Scale Guitar tops the list.